Note: This is part of a year-long series where I look at the events, issues, problems and successes in my corner of America and see how they compare with the country as a whole. Billboards about Vivitrol, heroin and drug counselling dot the landscape throughout my region of the country. This invasion of unhealthy drug use has impacted many families in Preble County and beyond. The stories of tragedy feel endless — from permanently disabled overdose survivors to teenagers who don’t survive. In the Sunday, Feb. 21 Dayton Daily News B-section centerpiece story, the reporter tells of a 36-year-old heroin overdose survivor who can no longer walk or eat on his own. As the mother, and others, tell their stories of personal struggles, the mom’s words reveal just how much heroin altered her life. My day starts at 6 a.m. I dry him, tube feed him and turn him every two hours…. He understands everything you say. He gives me a thumbs up. That’s how he communicates with me. We’re not solving the problem by sticking them (heroin addicts) in jail for six months. We’re solving the problem by educating them on ways to get their lives back together, Kettering Municipal Court Judge Jim Long said, the paper reported. This educational approach is also being used by various agencies in the rural county of 40,000 where I live. Recently my hometown paper, The Register-Herald, ran an article about a drug awareness program conducted at a local high school. The program highlighted how deeply heroin is embedded in my community. According to members of the Preble County Sheriff’s Office, heroin, along with methamphetamines and abuse of prescription pills remains common in Preble County. Heroin arrests have more than doubled in Preble County since 2012, having overtaken meth, meth labs and prescription pill arrests, according to official reports. Plenty of disturbing facts exist in that one quote — including meth and prescription drug abuse apparently being a normal, everyday problem for the community — but as the article further states officials are beginning to see some payoff for their work. …(a) former user told (Preble County Sheriff Mike) Simpson the amount of drugs she sees and is exposed to in Preble County since returning from her time in rehab is well below the amount she was experiencing while using the drug some 8 months ago. Because of Preble’s close proximity to Columbus, Dayton and Cincinnati, Preble County and southwest Ohio is one of the hardest hit areas in the state and the epidemic has spilled across the border into Indiana affecting the very young. In the past year, 54 babies were born addicted to heroin in Wayne County (Ind. ), one official noted. With children being born with a heroin addiction — is it actually possible that a long-term solution is being hampered by governmental policies and inaction? United Methodist Church Pastor Scott Bell says local resources are a key to recovery because once a person is hooked on the drug, breaking the grip requires a vigorous commitment. They need to be in counseling for at least a year,” Bell said. “They need to settle into a more constructive life. They can be weaned onto the pill form of the drug, but the psychological addiction never goes away. It’s difficult because the treatment centers are all gone. The government stopped funding them. Without adequate funding, treatment centers don’t exist and long-term solutions do not happen. In impoverished regions of the country, like Preble County (pdf), the burden of care and recovery is cast onto the addicted — people unable to buy their way into treatment and health. 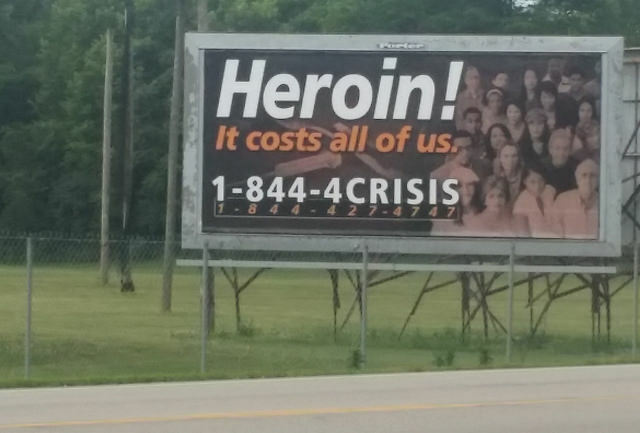 Regardless of one’s personal beliefs on why or how a person becomes addicted, the heroin epidemic is a societal problem and requires public funds to solve it. This means national, state and local politicians must reach across the proverbial aisle, compromise and deliver solid programs to undo the damage. Without local treatment options, the health of the community — and the lives of some of its citizens — are at stake. Although Ohio is dealing with a heroin epidemic, it is not the only state. According to Yahoo News, Ohio ranks 10th on the list of states with a heroin problem. The neighboring states of Kentucky and Indiana rank higher. According to the report, 10,574 people age 12 and older overdosed on the drug in 2014 (latest numbers available) — a substantial increase from 10 years earlier when 2,089 individuals died. It is also a problem in West Virginia, the state that borders Ohio to the east, as former West Virginia State Senator David Grubb explained last fall when President Barack Obama held a community forum there. Grubb noted that one of his daughters was introduced to heroin in 2009 and said she almost died from an overdose — her fourth — in August, 2015. His wife and he hope, Grubb said, that the August overdose would be the one that led to a successful treatment. We are full of hope. But we understand the pain — the pain in this room, the pain the families feel. The concern we have is access — where do you get the treatment? How do you get the treatment? For 25 years one of the most powerful GOP leaders, former Speaker of the House John Boehner, was my Congressman. In My Hometown, I blend statistical evidence with personal stories as I seek to understand how my hometown descended from the thriving community of my childhood to an impoverished area dealing with a heroin epidemic. 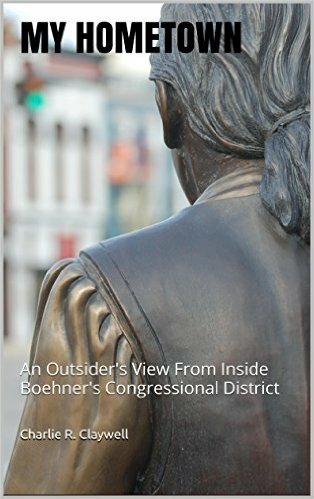 The eBook opens with the story of William Bruce, the man who founded Eaton, Ohio, and compares Bruce’s concepts of government and community to the methods believed and practiced today.